Well, we assure you, Mr. Newton would love Fergus and Elora because we love our bridges. 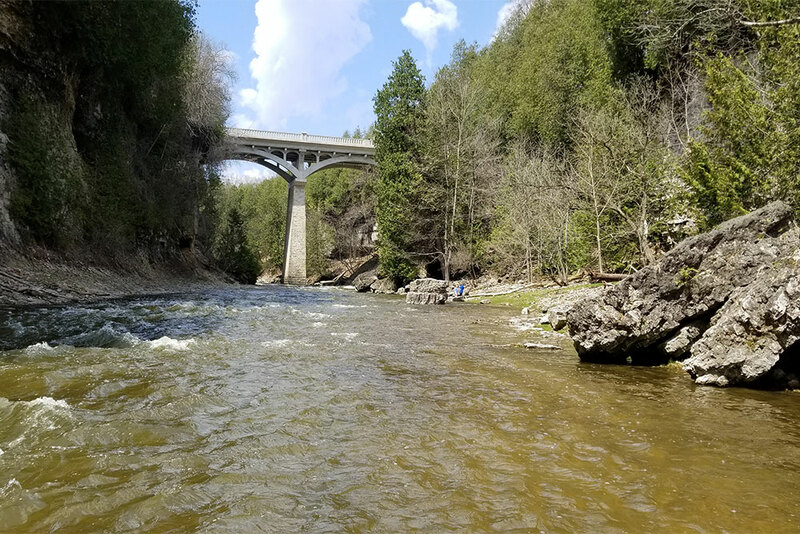 They aren’t just a means to cross over the beautiful Grand River and Irvine River, they are meeting places, special places – destinations in and of themselves. Some of the most spectacular views of our gorgeous region are best viewed atop these architectural structures that span across the rivers that unite us. We cross them by foot, cycle on them, walk our dogs along them, ski and snowshoe in the winter months by them, but no matter the season or the reason, we take time to stop on them and appreciate the spectacular views. We hope you will too. 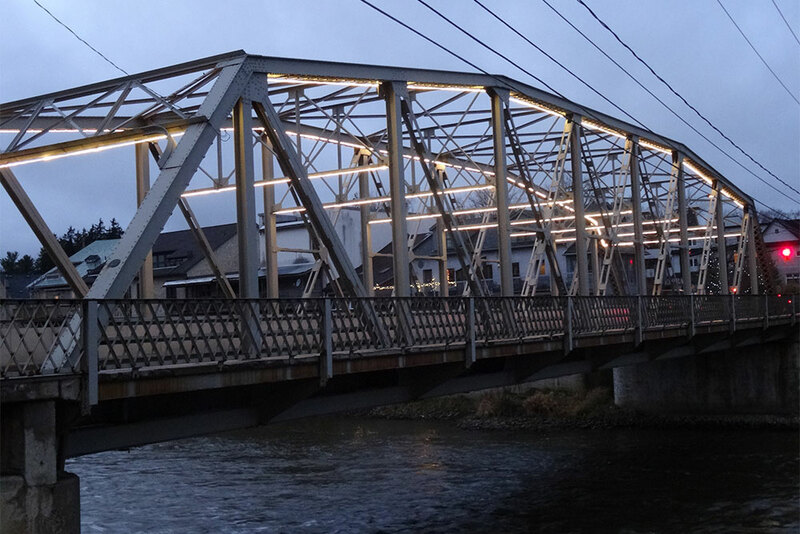 Downtown Fergus has many bridges to enjoy and we recommend you venture out and take a tour of them, day or night, to see the beautiful way this town appreciates its Grand River views. Most will drive into town across the Tower Street bridge, just as you enter the heart of the old town. But looking out a car window doesn’t do it justice. With free parking downtown, we suggest you ditch the wheels and put your heels to the ground, so you can get a sense of how nature not only runs through our town; it’s the essence of our history here. Looking west out toward the waterfall, as the Grand River rushes into town, or east to where the water flows several kilometers out toward Elora, the sidewalks on both sides of the Tower Street bridge offer a wonderful view. Behind the Fergus Library, the Milligan Footbridge draws visitors and locals alike to an accessible walkway with a wonderful vantage point of the water, connecting the Riverwalk area behind the renovated Fergus Library across to the historic Fergus Marketplace, with shops and restaurants to explore. Be sure to take a stroll through Templin Gardens and take the limestone steps down to the river’s edge. Don’t just tour by day, make a stop at night to see the waterfalls light up with coloured beams of blues and reds, giving the rush of the water a splendor worthy of an evening stroll. Coming October 2018, the brand-new St. David Street Bridge replacement will open just east of the Milligan Footbridge. Removed in winter of 2018, the old bridge was important to help with the flow of traffic along Highway 6, but it also held a nice vantage spot to view the Grand River in and out of town. We can’t wait to see the new bridge and once again look at the beauty of downtown Fergus and the mighty river that runs through it. On the edge of downtown Fergus, the historic Caldwell Bridge, built in 1955, is a Camelback truss structure. It carries traffic along Scotland Street to connect with St. Andrew, leading us into the heart of downtown Fergus, or north to neighbourhoods and businesses up towards Gartshore St. 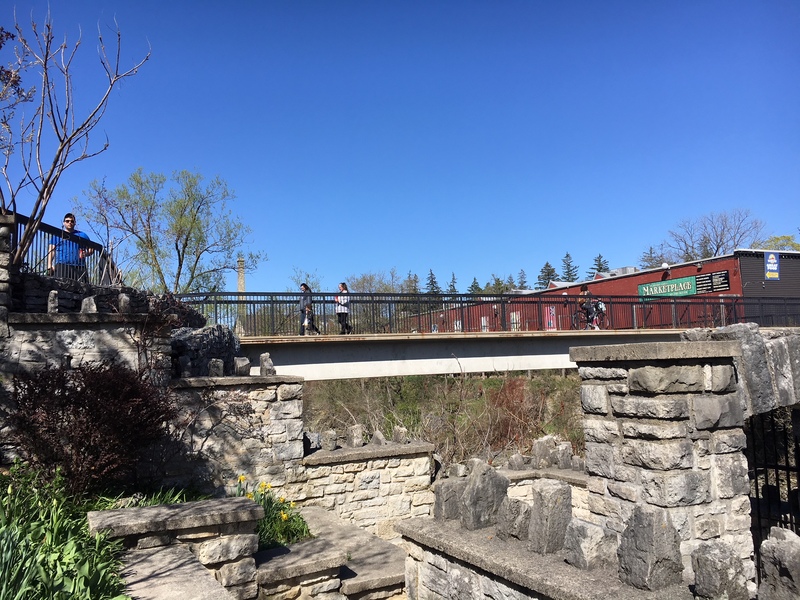 This bridge has sidewalks on the west side, overlooking the Grand River where the water flows quietly, just before dropping into a beautiful cascade beside the historic Fergus Mill. We highly recommend this view in early morning, when the mist rises off the river. Spectacular. Take this bridge down to the trail on the south end that leads into Confederation Park. It’s worth the walk. Looking eastward, the river is wide and quiet as it flows steadily from the not so far off Shand Dam at Belwood Lake. You’ll see some wonderful homes that back on to the river. In between Fergus and Elora, the grandness of the Wellington County Museum and Archives is matched by the equally impressive views of the Trestle Bridge, (which also happens to be a really cool place to look across the river and over the trees at the museum, high on the hill). 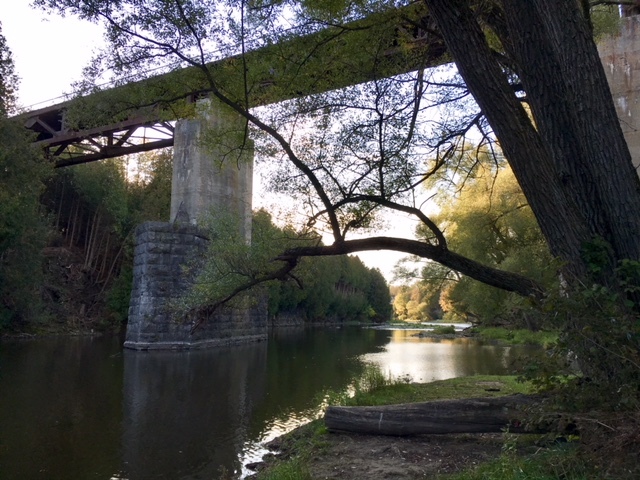 Accessible by the trail that shares its name, the bridge is a former railway bridge that towers above the Grand River and offers views of our region that you simply cannot find anywhere else. But take the trail down to the water’s edge and look all the way up, because the bridge itself is every bit as impressive as its views. Look up! Look down! Maybe don’t look down. How about, look over there! Some of the best views in Elora are from atop or beneath the bridges that are characteristic of this beautiful historic village. Bissell Park is a serene spot to take a walk riverside, leading up to the pedestrian bridge that connects our neighbours from the south side of town to the north across the Grand River. Just a short distance from the heart of downtown Elora, this bridge is the perfect spot to be still and listen to the waterfall, or gather with friends to take a photo. The Badley Bridge keeps cars, bikes and people moving in and out of Elora, and is, for many, a welcome site, crossing the Grand River directly into the center of town. 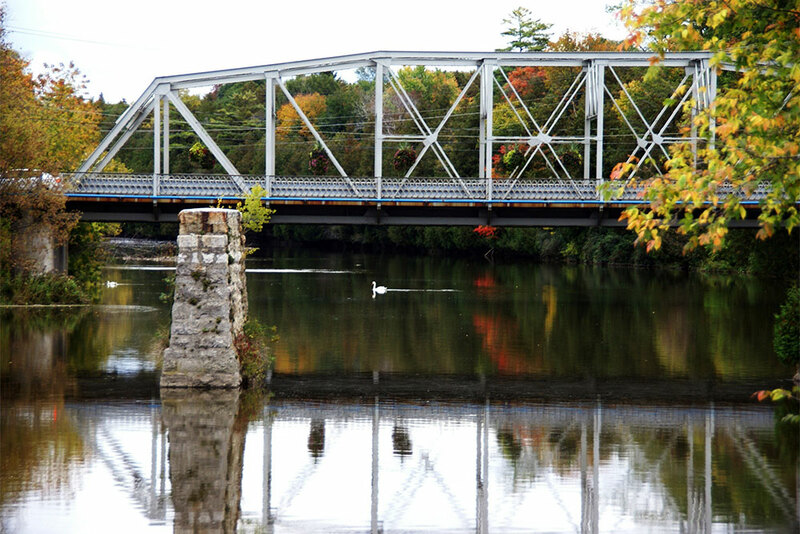 The riveted truss bridge offers views of the backdrop of homes and historic shops that line of the river, with the newly renovated Elora Mill Hotel and Spa and its continued construction merging the old town with the new. At night, the bridge is lit up with white lights, a beacon to be sure that whether you are coming into town or leaving, you are always welcome here. 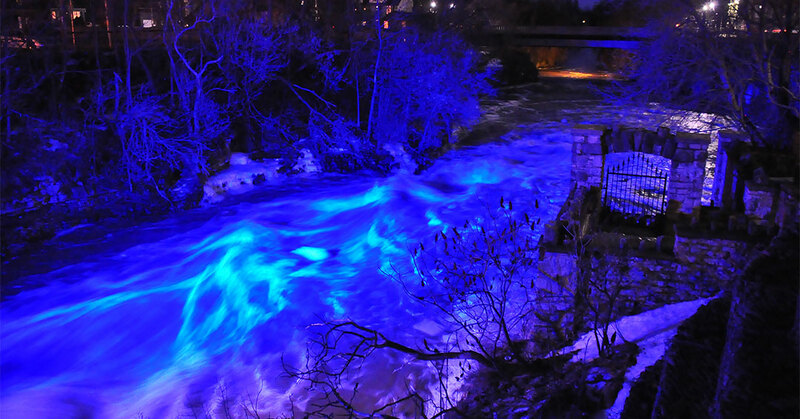 The David Street Bridge in Elora is not for the faint of heart, but it is for those who love a spectacular view. On either side, the view shows the depth and raw beauty of the landscape. Looking out, you can span the tree line along the limestone cliffs of the Irvine Gorge, just before the Irvine and Grand Rivers meet at the Elora Gorge. This historic bridge is an immense, proud structure, first built in 1868, and reconstructed in 2002, with the original pier remaining. 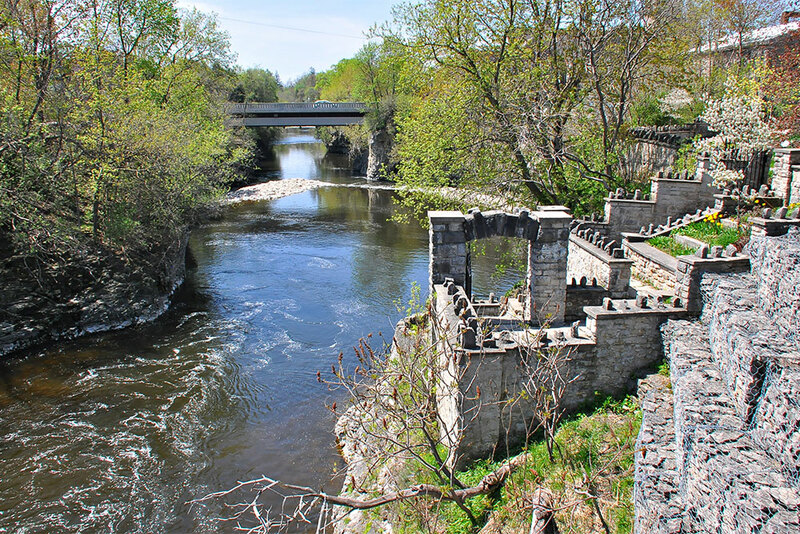 It is one of the most popular views in Elora and one of the most photographed from the river below. Taking the steep steps down to the river in Victoria Park, down to the rocky shoreline of the Irvine River, you’ll have the best view of this historic engineering masterpiece. The hamlet of Salem, just minutes outside of Elora, is not to be missed, though to those uninitiated with its charm, it can be overlooked. Stop and be charmed and be sure to bring your camera. 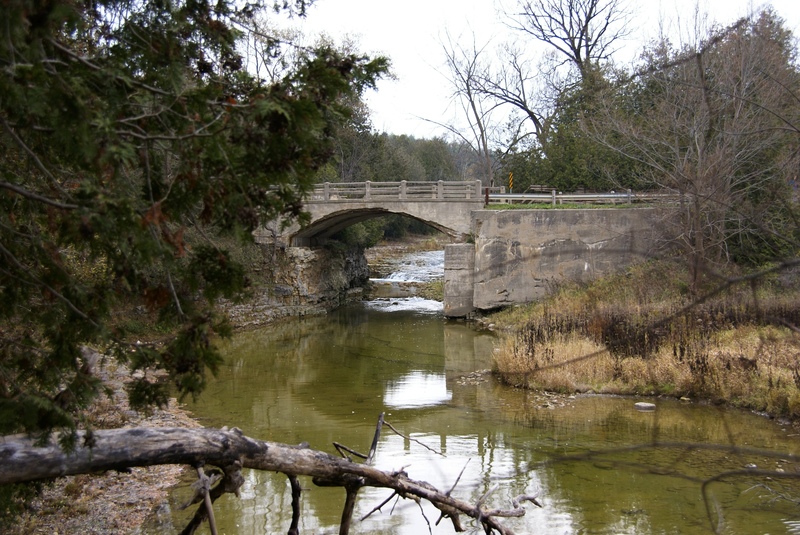 The Woolwich Street Bridge leads traffic to and from town across the width of the Irvine River, offering picturesque views of Veterans Park, with its pond setting before the water flows into the river to wind through the rocky cliffs of the Irvine Gorge, heading for Elora. And while this is the bridge most will cross, make time to seek out the Washington Street Bridge next to Veterans Park, accessible only by foot, looking over the waterfalls of the Irvine River as they rush in from the countryside to the quiet town, before filling the large pond at the park below, it is a lovely place to enjoy the sounds of the water. 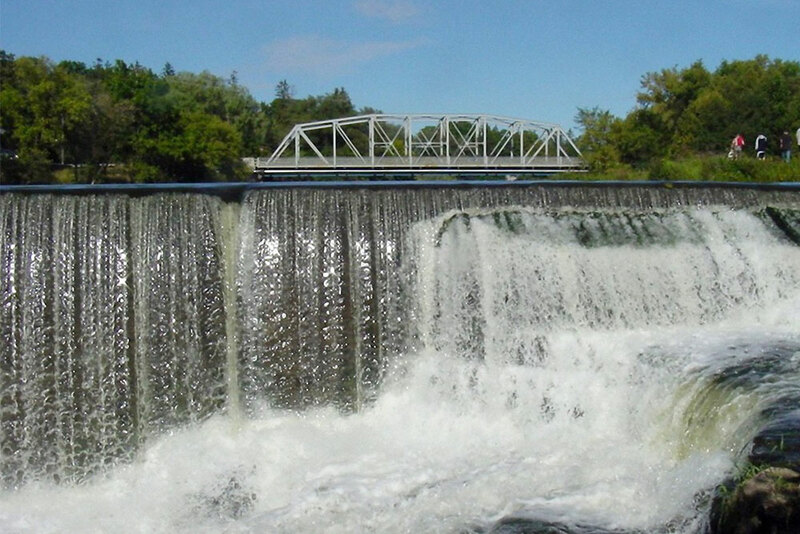 The Shand Dam is a historic feat as the first reservoirs of the Grand River Watershed. 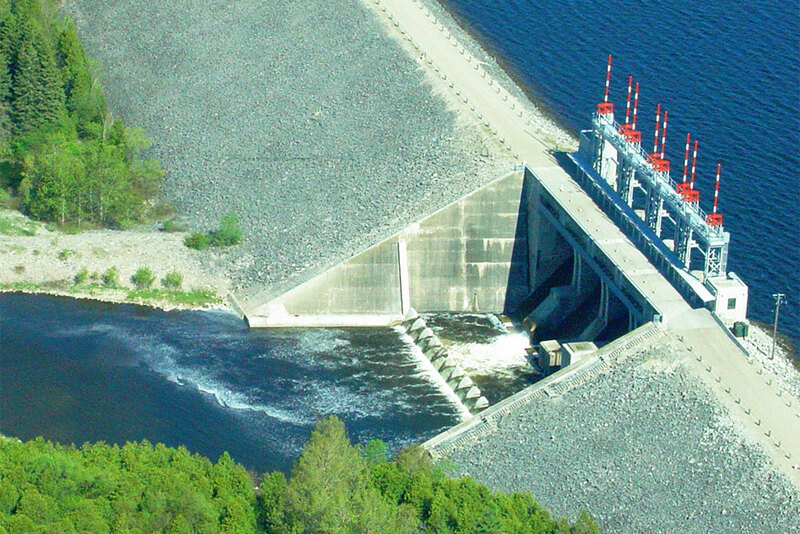 It has an important role in the management of water all year round and is an impressive site to see, whether you cross the top of the dam looking out towards Belwood Lake or the stream of the Grand River below, or if you take the long series of steps down to the river and look up at the massive structure that controls the flow of the Grand River heading to Fergus and Elora. Bridges build communities. We’re good with that. We hope you too enjoy the view.